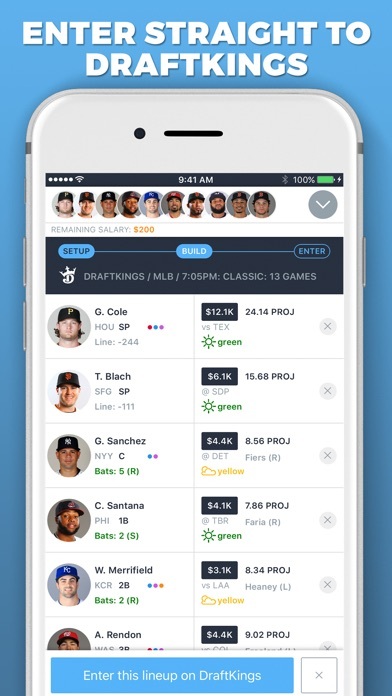 It has never been easier to build and perfect DraftKings lineups on the go! 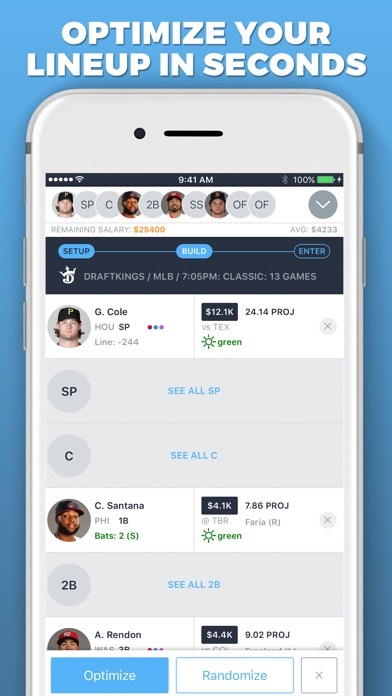 Build your own, custom optimal lineup for DraftKings in seconds with the RotoGrinders LineupHQ Express app. 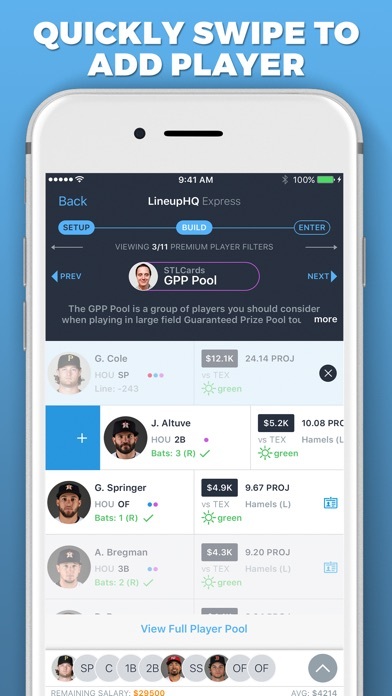 LineupHQ Express will allow you to: - Build a trustworthy DraftKings DFS lineup in just a few minutes, using RotoGrinders player projections system and expert picks - Sort players by position, DraftKings salary, projections, expected point-per-dollar value, and more - Include or exclude players with a single swipe - Automatically re-calculate your DraftKings optimal lineup with each change you make LineupHQ Express for DraftKings works for daily fantasy football, basketball, baseball, hockey and golf. 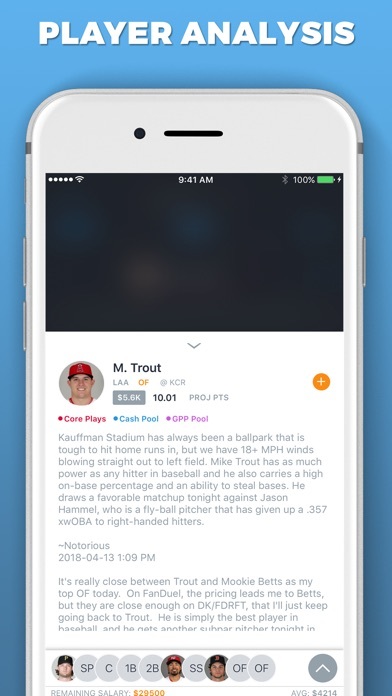 Whether you’re playing DFS NFL, NBA, MLB, NHL, or PGA this is the app for you! 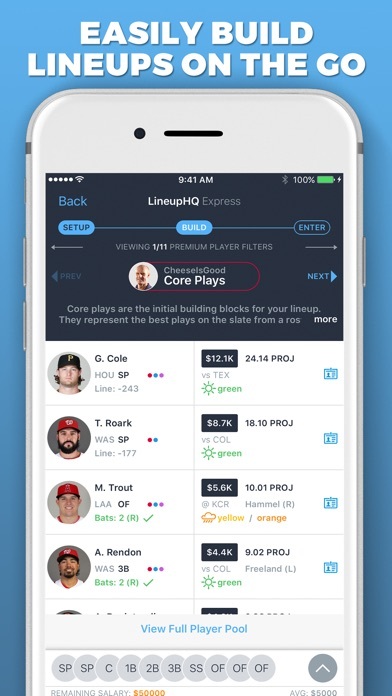 In App Purchases – LineupHQ MLB, NBA, NHL single use content is available in the app for $1.99. 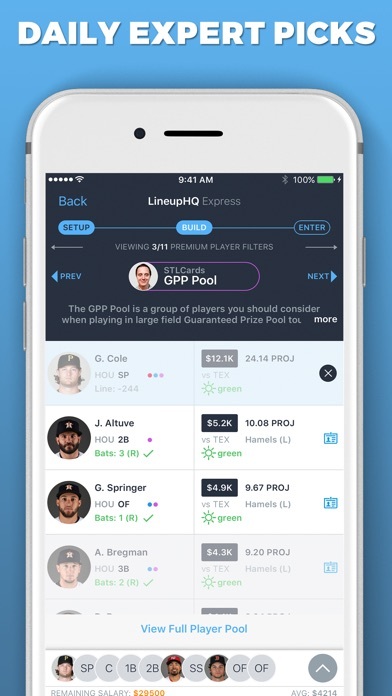 – LineupHQ NFL and PGA single use content is available in the app for $4.99. 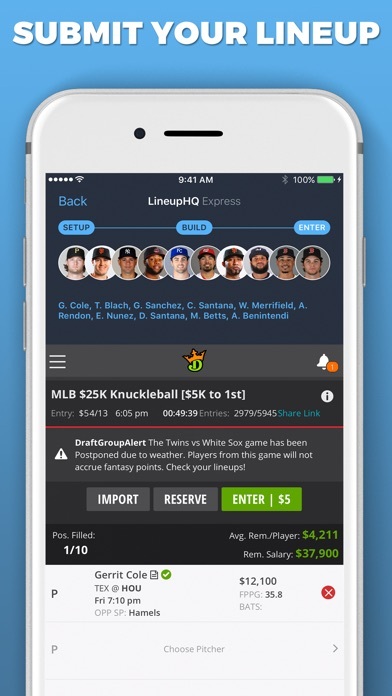 – LineupHQ Express DraftKings Premium – Monthly auto-renewing subscriptions are available. – $9.99 monthly – Payment will be charged to iTunes Account at confirmation of purchase – Subscription automatically renews unless auto-renew is turned off at least 24-hours before the end of the current period – Account will be charged for renewal within 24-hours prior to the end of the current period, and identify the cost of the renewal – Subscriptions may be managed by the user and auto-renewal may be turned off by going to the user's Account Settings after purchase – https://rotogrinders.com/static/privacy-policy – https://rotogrinders.com/static/terms Spend less time building the optimal lineup and more time enjoying the games. 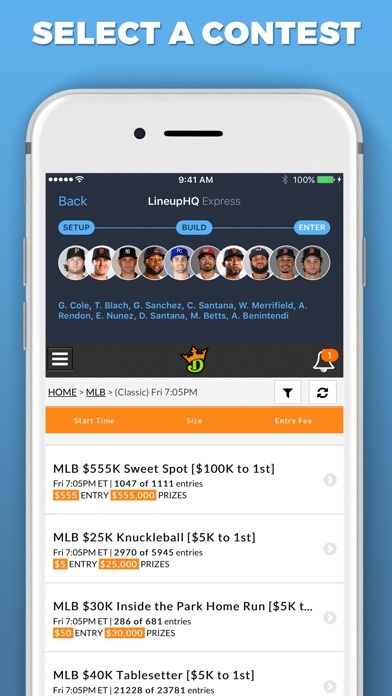 Download LineupHQ Express for DraftKings now! Great way to make a lu on the fly. Lock your core or GPP players optimize upload and go. Amazingly easy and great! I can’t really afford to pay for the membership. But really enjoy the articles and the lineup builder. Plus all the podcast and free information that is provided. It really helps even if it’s not all the premium stuff. Also enjoy all the pod casts. Shout out to Steviepfl, Beermaker, Chop, Noto and the rest of the crew for always laying it down each and every week. Props to you guys! This is an awesome sports lineup optimizer but I have not won anything from using this app using draft kings. This site has been excellent and given me the chance to improve my fantasy line ups. I’m so glad to have found it. I like this app for the most part, but why should I pay for a service when the importing lineups into DraftKings doesn't even work? I also suggest showing how many points the players have scored in previous weeks. It’s not bad but it could be better. Doesn’t optimize very well. Sticks to the same players. App won’t open.. keeps saying error. I don’t know much about fantasy sports, but this app helps me make competitive lineups consistently. Worked so well for so long. Great tips and experience. But guess what? Had to jump on the pay me bandwagon and now you have to have a paid subscription like ROTO. Also.. the app is broken as can be. Great job killing off yet another good thing.